You Will Inscribe Them Upon the Doorposts of your Pueblo | Jacob Wake Up! A bajillion years ago my aunt, uncle, and cousins in Phoenix, AZ bought me a beautiful mezuzah when I became bar-mitzvah. While they couldn’t make the ceremony, they sent that as well as an Artscroll chumash (the 5 books and selections from the prophets with translation and commentary). These were among the most memorable and thoughtful gifts I received. The chumash, beautiful in itself, had a lovely personal note which makes me think of them everytime I pick it up (whether or not I subscribe to all of the translations and commentary in artscroll, an Orthodox publisher, is another post and not the point). 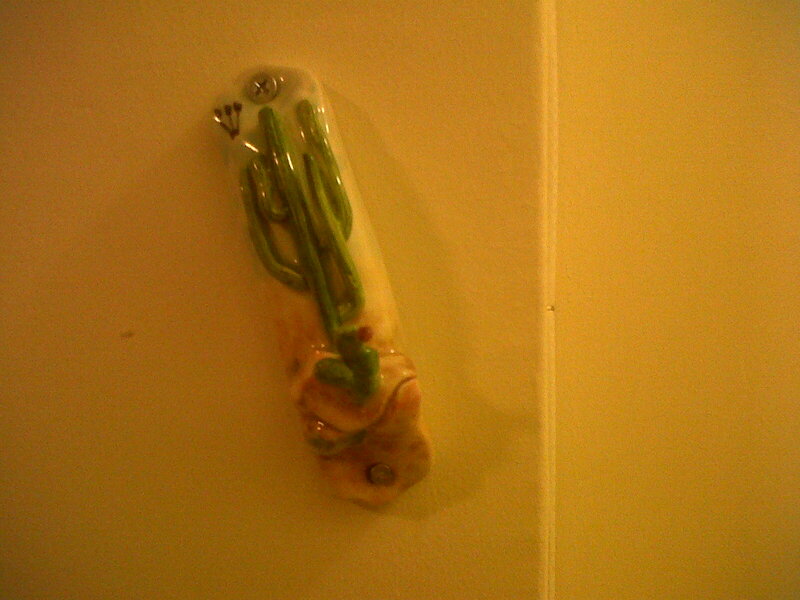 The mezuzah, as you can see, was equally beautiful, ceramic, and had a cactus on it. My cousins have always lived in Arizona and the cactus was the perfect touch. How could I not think of them when I looked at it? Except that’s the point: you have to see it. It’s hung at eye level. I couldn’t see it because it’s sat in its packaging more or less since I received it. At 28, in my umpteenth apartment since graduating college, I’m finally hanging it. What took me so long? At my mom’s home, before graduating high school, I just had the same mezuzah on my bedroom door that I’d had since I was very little (I think it was a boy with a red balloon but I’m fuzzy). I think I was saving the cactus mezuzah for my first dorm or apartment. Except, I was hesitant because I really liked this one. I wasn’t going to just use some 3M sticky thing to attach it to my dorm doorpost. The same went for the house I lived in my last year. I wanted it safe. Did you trust all of your college neighbors? Those hallways could get pretty rowdy. I also can’t help but feel like there was some latent fear of anti-Semitism hiding in there. “I don’t want to attract attention to myself.” “What if it gets vandalized.” When I lived in the AEPi house at UConn–a house full of more yids–we didn’t event hang one on the house. We made excuses about it becoming the subject of a mindless frat prank. Again, I think there was more going on. The last few years, I’ve seemed to continue coming up with excuses and never get around to it. But now I’ve got my own apartment. It’s still fragile and I’d prefer it not be on the outside, so I hung it in the doorway between my entrance way and main room (I have a studio, it’s just the one room). It sits under a nice, somewhat out of place arch. I will get some of that 3M wall stuff and hang a more durable one outside (I even went to the grocery store around the corner to see if they had!). Why is it such a big deal? I think for me it was a fairly adult move and commitment. I’m fairly interested in the intersection of the physical and the spiritual in Judaism (why we sway when we pray for example). The mezuzah is a physical representation of the spiritual (or the traditional, the familial, the religious, the cultural, your pick, I’m not getting into that here). More importantly, hanging a mezuzah is one of the greater meta-mitzvot (meta-commandments)–commandment to do commandments. Hang a mezuzah so you’re reminded of all the other, 612 or so, commandments you should be observing. That’s why it’s set at eye level. So you see it. (Tzit-tzit work the same way.) Mezuzot are not about good luck; having a non-kosher mezuzah won’t bring you bad luck. Most importantly, this was the first step in making my home as Jewy as I want or don’t want. Next step: kashering the kitchen on my terms. Regarding the title of this post, I lived for a year in Tucson, a.k.a. “The Old Pueblo.” Additionally, This post was not sponsored by MyJewishLearning.com, I just really like their explanations. I promise my next post will be about ska. 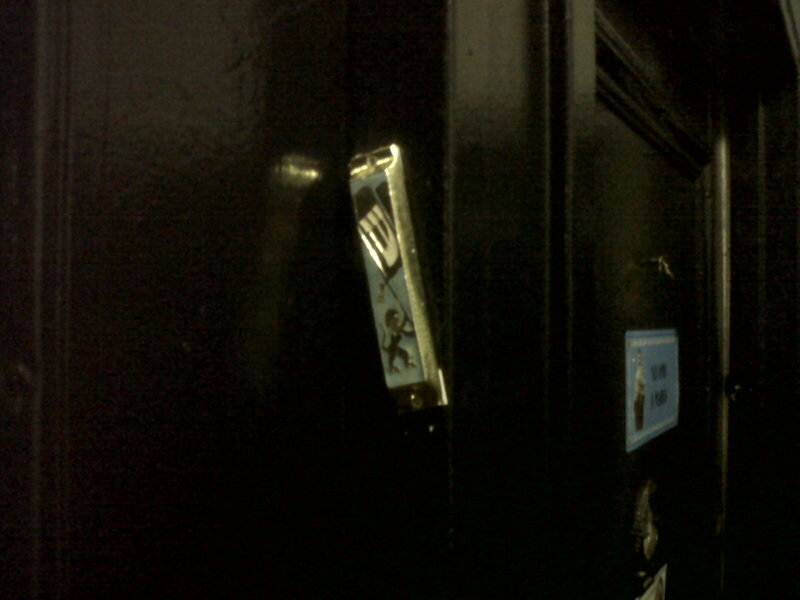 UPDATE 9/24/11: I hung a mezuzah outside the door to my apartment.